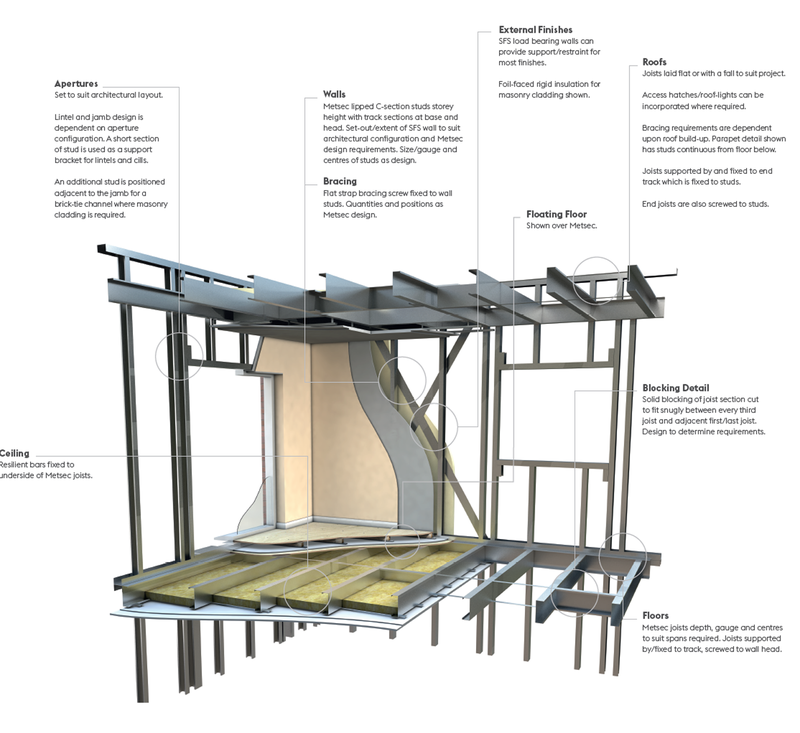 SFS load bearing is a complete load bearing system suitable for structures up to 3 storeys without the need for a primary hot rolled or reinforced concrete frame. Load bearing structures make use of the axial capacity of the Metsec SFS studs, with studs designed as a series of columns to provide complete load bearing wall panels. The system provides a complete load-bearing superstructure for low to medium rise structures with all Metsec components supplied to site loose and are assembled in-situ with Tek screwed connections. This system has many advantages over traditional methods of construction. It is light-weight, fast track, durable and is suitable for confined sites. This flexibility makes load bearing structures ideally suited to penthouses or high level inset structures where it is important to keep the loads to a minimum. It also benefits from reduced crane and transport costs, when compared to pre-panelised solutions. Load bearing structures require a full Metsec design prior to commencement of work on site.